MAIA Eco Skate 2009 - Saving the planet, one skate at a time! The Maia is the T:Nine version of an environmentally friendly skate. She features a Stability Cuff, K2 Softboot, 84mm wheels, ILQ-7 bearings and our revolutionary Bamboo frame. Designed to fit the unique foot shape of a woman, the Maia’s upper is made out of recycled materials that are both breathable and comfortable. This is the flagship for what inline skates are to become! 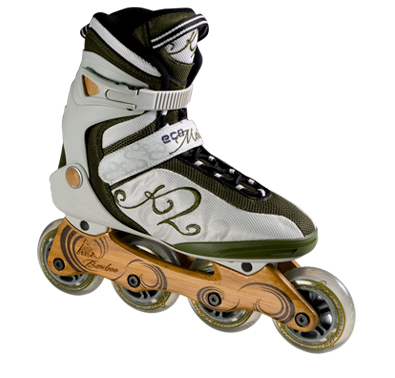 The K2 Softboot™ construction is the most comfortable, stable, and well-designed inline skate construction ever produced. 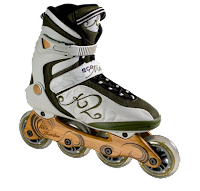 This patented technology features the most breathable uppers, supportive cuffs, and best fit known to any inline skate.